Today I'm sharing a Guest Post from Liz of Brighter Sides. 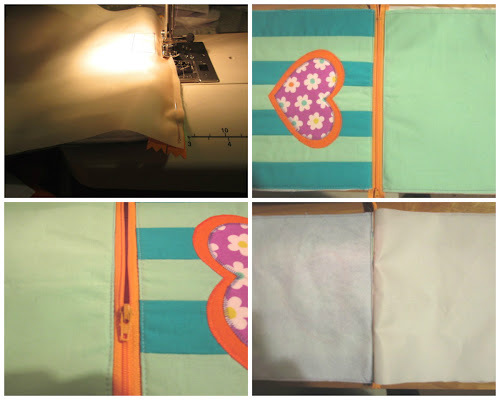 This is a tutorial for a lightweight, medium/large size cosmetic bag. The striped patchwork background gives the bag surface more interest and variation but still lets the appliquéd heart motif stand out. I wanted a fun, bright bag to suit the Japanese daisy print. The bag has a waterproof interior and the outside is constructed from cotton fabrics of similar weights. The structure is very simple- it's a rectangle with squared corners (flat bottom). Both front and bag panels have been given structure with interfacing and padding. - OPTIONAL: Little scissors for snipping thread ends. - Two similar colours/shades of cotton fabric for the front panel. You will be sewing strips together to make one patchwork rectangle 9 1/2 x 8 inches (24.1 x 20.3cm). If you are planning to use one of these fabrics for the back panel as well, make sure you have enough to accommodate this. - 9 1/2 x 8 inch (24.1 x 20.3cm) rectangle of another fabric for back panel. You could pick one of the cotton fabrics you're using for the patchwork, or pick a different cotton fabric. - Two squares of fabric cut to approximately 6x6 inches (15.24 x 15.24cm). 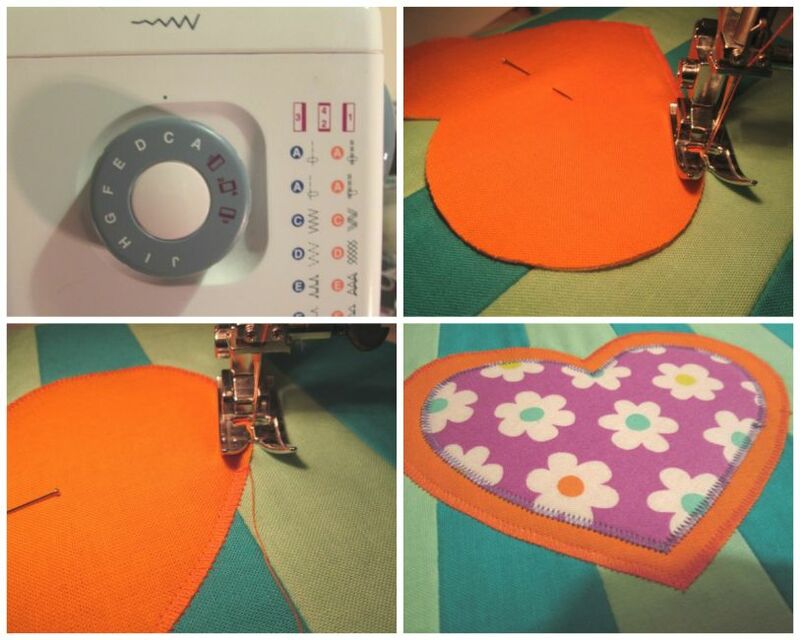 These will become your two heart appliqués. You probably want these two fabrics to complement each other and also stand out from your background fabrics. 1. Have all your materials prepared and to hand. Iron fabrics. 2. Cut 7 strips in total of your front panel fabrics: 3 of one, 4 of the other. Each strip should be 1 7/8" x 8" (4.8cm x 20.3cm). The width measurement includes 1/4 seam allowance on both long edges of your strips. When this is all sewn together your panel will become the right width. 3. Sew your strips together, one long edge to another with 1/4 (0.6cm) seam allowance. The second photo below shows how your finished patchwork piece will look when turned right side up. 4. Take the patchwork piece to the iron, with wrong sides of the patchwork panel facing up. Carefully press all seam allowances to one side, or press open as I have here. 5. Iron on your interfacing, following the manufacturer's instructions. 6. Now for your appliqué! Iron on your interfacing onto both your appliqué squares. Draw around your template on the reverse of these pieces, then cut out. 7. 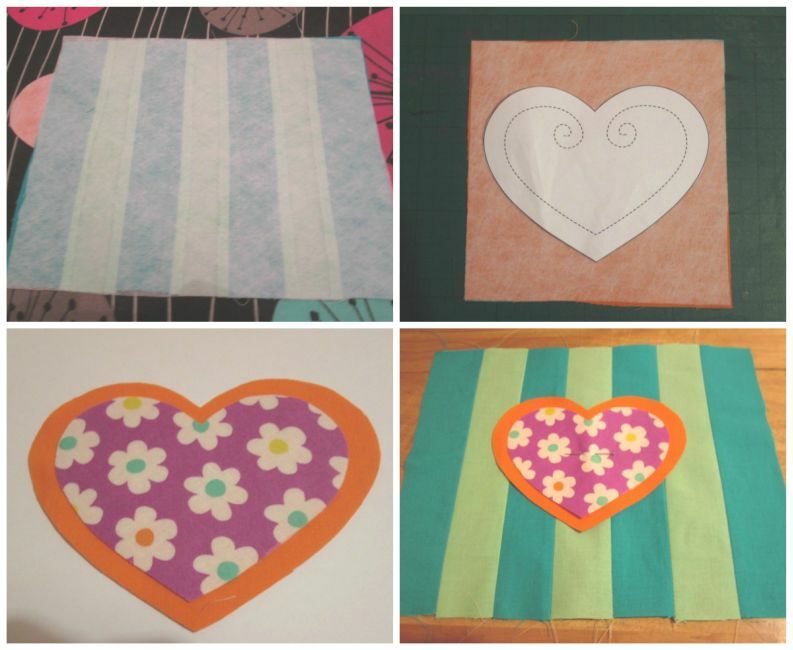 Find the centre of your patchwork panel and pin your larger fabric heart at this point. I've pinned both hearts down (seen in the fourth photo below) before any sewing, but it's probably easier to pin and sew one, then pin and sew the other. 8. 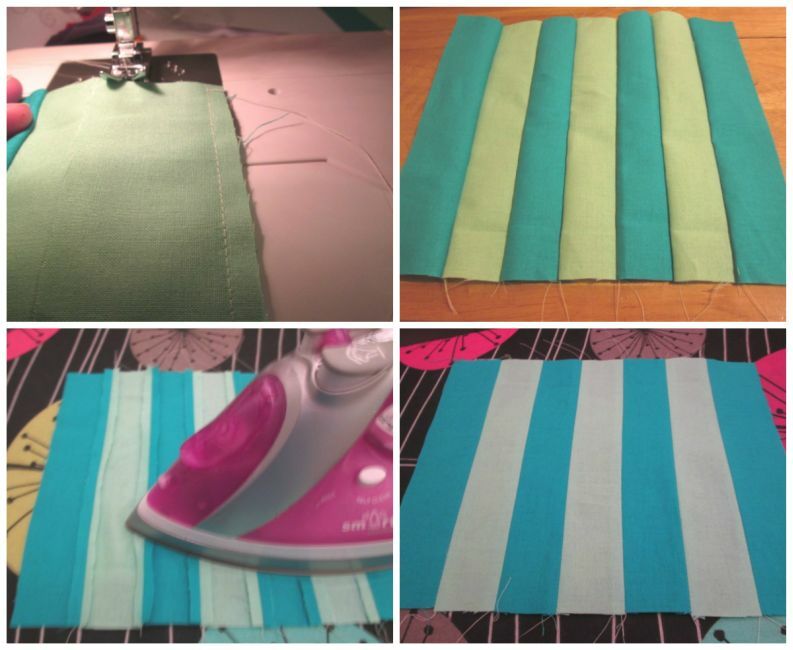 Set your machine to a zigzag stitch. Make sure it's threaded with the appropriate thread. 9. Position your front panel with the pinned appliqué under your presser foot. Lower your needle with the hand wheel just outside the edge of your appliqué. 10. Zigzag around the perimeter. You can stop stitching at any point to lift the foot and rearrange the angle of the fabric to help you. Just make sure the needle is in the down position and on the outer edge of your shape. When you get all the way around, backstitch about 1/8 " (0.3cm) back over where you started sewing. 11. 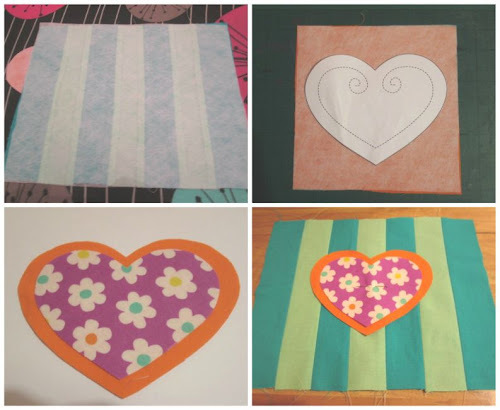 Do the same with your smaller heart, pinning or just placing it in the centre and zigzagging around the perimeter. 12. 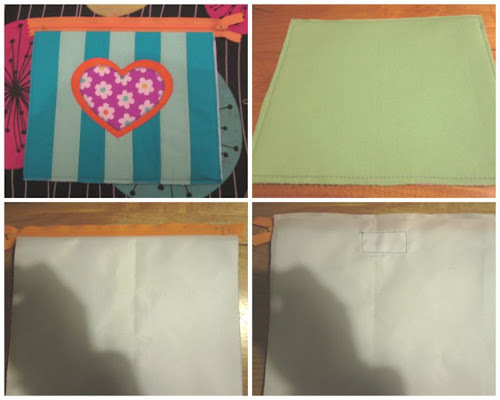 Sew your fleece pieces onto the reverse of your front and back panels. 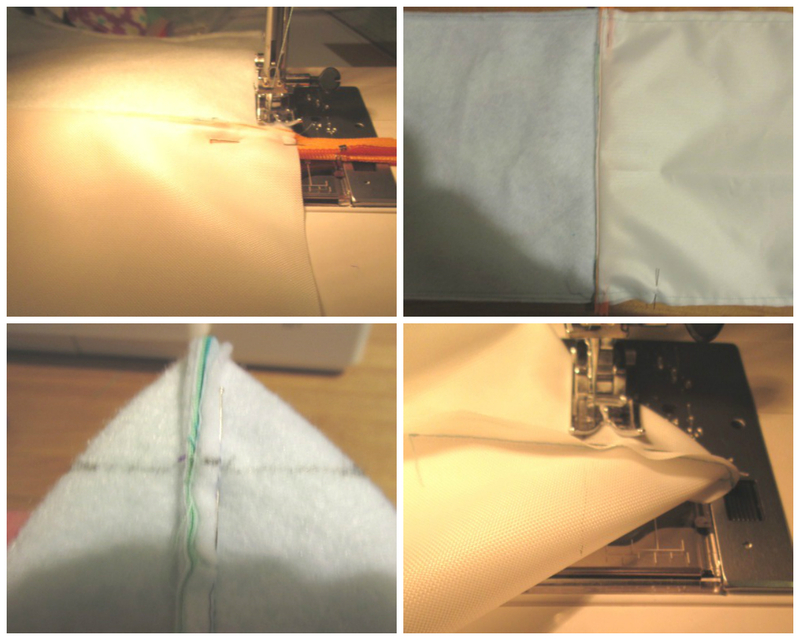 To do this, pin them and sew around the edges (inside your allocated 1/4" (0.6cm) seam allowance) with your machine's longest straight stitch. This will stop them shifting around annoyingly as you sew all the layers of the bag up later on. 13. Time to attach the zip. Lay your front panel down face up. Then, place your zip face down across the top edge of this panel. Line it up roughly. Place one of your lining pieces down on top, and carefully pin through the lining, zip and front panel. 14. Using your zipper foot (these feet usually come with your machine), sew across the top, close to the edge of the zipper teeth. I've only used a standard foot here as my zipper foot isn't very good. 16. Now place your back panel right side up. On top of this place your front panel face down, then your remaining lining piece (with your label sewn on if you're using one) face down. 17. Sew across the top, again stitching close to one edge of the zipper teeth. 19. Iron either side of zip. Do this on the main fabric side and then flip over to press the lining side. 20. Topstitch each side of the zip, very close to the edge. Open up the zip around 3/4 of the way down, so you can turn the bag right side out later. 21. Pin your whole bag piece so that the lining sides are right sides together and the outer is also right sides together. Your zipper should then be lying sideways in the middle. Pin around all sides. Note: the main bulk of the zipper should be sitting towards the lining side. Pay attention when pinning, especially at the zip ends so that they are properly aligned. 22. Start sewing up your bag! You'll need to leave a gap in the lining of about 4" (approx. 10cm) to turn your bag right side out after this step. I recommend starting sewing on the bottom edge of the lining, right after where your gap will be. Sew around the perimeter. 23. Your bag should now look like the second photo below. Have a look at my stitch line, including where I've left the gap in the lining side. You have to squint a bit- sorry for the blurry photo! 24. You now need to square all four corners of the bag before turning it right side out. You have to pinch each corner so the seam lays in the middle and the ends look triangular as shown. Pin through the seam. Mark down 1 1/4" (3.2cm) in from the point as shown. 25. With all four corners pinned and marked, sew across the line on each. Now trim the little triangles outside your stitch line off, leaving 1/4 " (0.6cm) of raw edge. Turn right side out, bringing the bag through the gap you left in the lining. Shuffle everything around a bit. 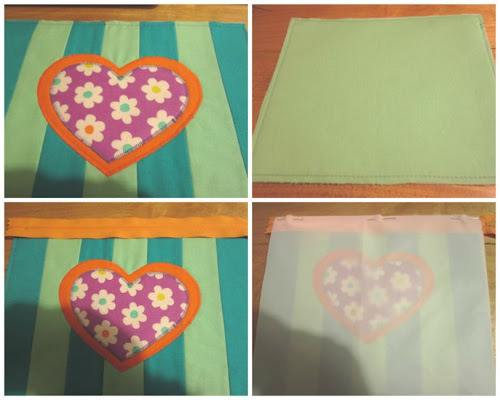 Then give your new make up bag a press (take care when pressing the waterproof fabric) and sew the gap in the lining shut. Do this by tucking the raw edges back under 1/4" (0.6cm) and slip stitch, or machine sew close to the edge. This tutorial is for non commercial use only: you can use it to make as many cosmetic pouches as you want for yourself or as gifts, but please don't make any for sale. You may borrow a few photos if you want to blog about this project, but remember to link back to the original source, and do not reproduce the entire tutorial on your site. Thanks! Liz is a twenty-something crafter from the East of England. She recently opened an Etsy shop under the name Brighter Sides and keeps updates of her crafting and other bits and pieces at www.brightersidesaccessories.blogspot.co.uk. Great tutorial! I haven't really done much appliqué but I want to try it out. I love the fabrics of this bag, it's adorable! I've not done fabric applique since I was in school doing my textiles GCSE! I definitely need to revisit it.